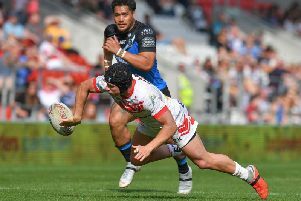 Saints 19s will take on deadly rivals Wigan Warriors in the Academy Grand Final at Langtree Park on Sunday. The game will kick off at 2pm and is a repeat of last year's showpiece. Derek Traynor's side head into the game unbeaten, having won 21 of their 21 games this season, but that will count of nothing against last season's Grand Final winners. Admission prices will be £5 (adults) and £2 (juniors and concessions) for the South Stand, while Saints' Members can pre-purchase theirs for £3 and £1. However, members prices won't be available on the day of the match. There will also be cash turnstiles on the day and the Red V Cafe Bar will be open from 12.30pm.